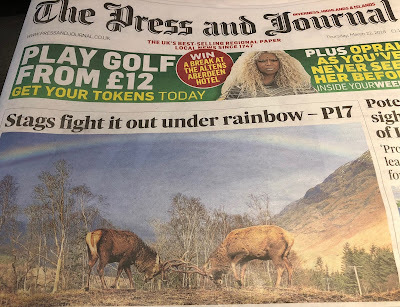 Red Deer continue to inspire Scottish people of all generations- and sell newspapers! Hill users are being asked to take care to avoid disturbing deer over the Easter holidays as the prolonged winter has exacted a heavy toll on Scotland’s iconic species. With a return to wintry weather predicted, stalkers are reporting many deer severely weakened by having their food source cut off and are cautioning against stressing the animals further. The long winter has seen higher than normal levels of wildlife mortality, with sea creatures washed up on beaches and conservation groups urging the public to help vulnerable song birds survive to breeding time. Some farmers are reporting difficulties with lambing due to the prolonged winter weather. Deer have also been hit hard across Scotland’s hills with food buried for months under deep and drifting snow which has then crusted over with hard frost, leaving vegetation virtually inaccessible. Stags already in poor body condition after the annual rut, where they fight for females- sometimes to the death- have been particularly hit by weather events such as the Beast From The East. In poor weather, deer retreat from the high tops to lower ground for shelter but have not yet returned to the tops in many areas as they are too weak from having food cut off by snow. It will be more likely that those talking to the hills for recreation this Easter will encounter deer and are being asked to be mindful of their plight, if possible. “It is probably the worst conditions for over a decade for deer. Normally it is harder for them in the west during winter because it is generally wetter. 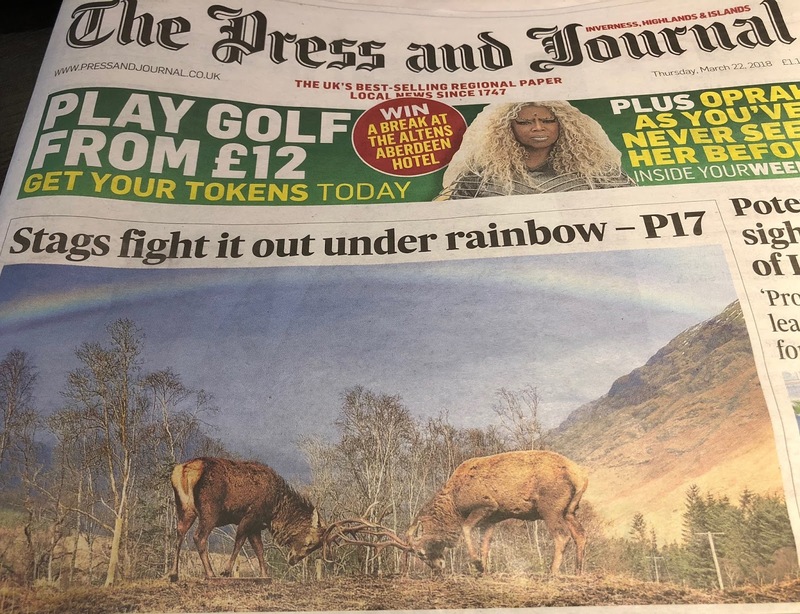 However, this is affecting deer all over the high ground in Scotland whether numbers in that area are relatively high or number very few,” said Lea MacNally, of The Scottish Gamekeepers Association, a professional stalker for almost half a century. “The food source is there, they just can’t get it due to the length of time there has been full snow cover. Every winter there is an expected natural mortality but there has been much higher than normal mortality this year. Deer are having to expend a lot of energy scraping down through frosted snow to get to food and, in many areas, snow hasn’t lifted for a long time. The deer’s backs have not been dry for months and some calves are barely standing. “If folk are out and about over Easter, where possible, they should try and give the deer a wide berth so as not to move them out of shelter. Disturbance causes deer to move and, if people take care to avoid that, it could make the difference between life and death for weakened animals. Stalkers are warning the public that, should they see deer that have succumbed to the weather, it is likely to be around hill burns where they have moved to seek shelter. Studies in other European countries like Norway have shown the link between hard winters and deer mortality (2) so, while concerning, this phenomenon is not unusual at the northern edge of the red deer range. The latest SNH report on Deer Management in Scotland, 2016, reported that increases in deer numbers on the open hill have halted in Scotland in the last 15 years (1), allied with higher culling effort. 1/ Reference: Deer Management in Scotland, Scottish Natural Heritage, 2016. “The results indicate that the population of red deer in open-hill ground in Scotland has been increasing. Data from 1960 - 2016 show that deer density increased steadily since 1961 (around 8 deer/km2), and peaked in 2000-01 at around 13 deer/km2 – an increase of 60%. In the last 15 years, the population growth appears to have halted and the estimated deer density in 2016 is around 12.5 deer/km2. Figure 3.1 illlustrates the changes in deer density (stags, hinds and calves) since 1961. The trend supports the contention made by Clutton- Brock et al5 that the population growth rate was slowing by 2000.